Over the course of nine seasons, Ray Romano endeared himself to audiences as Ray Barone, a Long Island sportswriter juggling work and family, including his parents and older brother, who live right across the street. Here are some facts about the Emmy Award-winning series, which debuted 20 years ago today. 1. THE SHOW BEGAN AFTER RAY ROMANO DID A STAND-UP SET ON LATE SHOW WITH DAVID LETTERMAN. "I was doing stand-up for 12 years," Romano recounted to Larry King in 2005. "I did my first stand-up spot on Letterman and then the following week his company called me up to say, 'We want to try to develop a show based around what we saw.'" 2. ROMANO DIDN'T LOVE THE TITLE. 3. DORIS ROBERTS THOUGHT SHE WOULD BE TOO BUSY TO EVEN AUDITION. Doris Roberts was busy directing a play while the Marie auditions were taking place. The play’s producer made sure to have her available for 3:30 one fateful Monday. She beat out over 100 other women for the part. 4. PETER BOYLE WAS PERFECTLY ANGRY AT HIS AUDITION FOR FRANK. Peter Boyle had trouble just getting into the studio lot. He then couldn’t find a parking space. Then he went into the wrong building. By the time he reached Romano and show creator/showrunner Philip Rosenthal he was, in his own words, “enraged”—and perfectly in character for Frank Barone. The topper of it all was that, according to Romano, the CBS president was going to give Boyle the gig anyway. 5. CBS OFFERED CAROL FROM FRIENDS THE PART OF DEBRA. Jane Sibbett (Ross’s first ex-wife on Friends) declined the role once she discovered Romano was both unaware she had been offered the role by the network, and that Romano was pushing hard for Patricia Heaton to play his on-screen wife. Maggie Wheeler, who played Janice on Friends, auditioned for the role of Debra, too. She ended up playing Debra’s friend Linda over the course of the series as a consolation prize. Heaton wasn't officially cast until one week before the pilot began shooting. 6. RAY IS OLDER THAN HIS "OLDER" BROTHER. Brad Garrett, who played Ray's older brother Robert, was 36 when the series first started. Romano was a few months shy of his 39th birthday. 7. PHILIP ROSENTHAL'S WIFE GOT USED TO STORIES FROM HER MARRIAGE BEING WRITTEN INTO THE SHOW. Monica Horan—who played Robert’s on-again-off-again girlfriend and eventual wife Amy—was married to the show's creator, Phil Rosenthal. She got used to her arguments with Rosenthal ending up in scripts. Horan told People about an episode where Debra has PMS: "I'm hearing lines from conversations I had with my husband. Ray was telling Debra to take medication, and she was telling him she needed a hug. I was like, 'Whoa.' I was crying, then laughing, then crying. It was surreal." 8. THE NAMES OF THE TWIN BOYS WERE CHANGED AFTER THE FIRST EPISODE. In the pilot, the kids were known as Matthew and Gregory, but were subsequently turned into Michael and Geoffrey for the rest of the series. Romano’s own twin sons are named Matthew and Gregory; he decided that art was imitating life a little too closely and asked for the names to be changed. Matthew and Gregory not only got new names, they got new actors to play them: Rosenthal cast Sullivan and Sawyer Sweeten as Michael and Geoffrey, respectively. They were the real-life brothers of Madylin Sweeten, who played their TV sis, Ally. The inclination to separate fact from fiction never seemed to apply to Ally, who kept her character name despite being based on Romano’s real daughter, also named Ally. Not only that, the real Ally (Alexandra Romano) played TV Ally’s friend Molly on the show. 9. RAY’S BROTHER WAS A POLICE OFFICER, WHOSE COLLEAGUES MADE FUN OF HIM. “Well, my brother was—he is a retired cop now, but at the time he would take a lot of stuff from the other cops," said Romano. "They think it's a documentary.” While Garrett put his own spin on the character to differentiate Robert Barone from Rich Romano, there was a point where Ray's brother—an NYPD sergeant—moved back in with their parents. 10. PATRICIA HEATON’S FATHER WAS A SPORTSWRITER, LIKE RAY BARONE. 11. PETER BOYLE’S CAREER WAS ALLUDED TO TWICE IN THE SAME EPISODE. In “Halloween Candy,” Frank gives the same speech about mortality he famously gave to Robert De Niro’s character in Taxi Driver (1976). He also dressed as Frankenstein’s monster, a nod to his work in Mel Brooks’s Young Frankenstein (1974). 12. THE SHOW MADE ROMANO THE HIGHEST PAID ACTOR ON TELEVISION. Romano made $1.7 to $1.8 million per episode during the last two seasons of Raymond, surpassing Kelsey Grammer's $1.6 million per episode salary for Frasier at the time. 13. THE SERIES ENDED WHEN THE WRITERS RAN OUT OF IDEAS. 14. THE SERIES FINALE TAPING WAS DELAYED BY ONE WEEK. Patricia Heaton fell ill, and by the intended showtime her voice was completely gone. The audience was sent home, and told to return seven days later. 15. RAYMOND IS LOVED ALL OVER THE WORLD. The Voronins, or Воронины, the Russian adaptation which Rosenthal attempted to help, was Russia’s number one comedy, and performed original episodes after going through all 210 of the American installments. 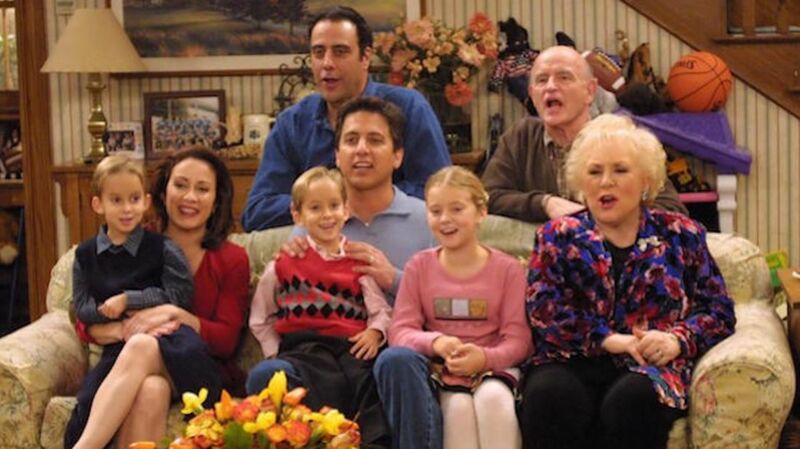 Local-language versions of the show were also produced in Egypt (Close Doors); Israel (You Can’t Choose Your Family); the Netherlands (Everybody Is Crazy About Jack); Poland (Everybody Loves Roman, which was canceled after four episodes), and the Czech Republic (Everybody Loves Rudy). In the United Kingdom, a pilot was shot (The Smiths).